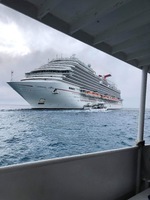 My travel friend and I just returned from our February 10-17 cruise on board the Carnival Vista. 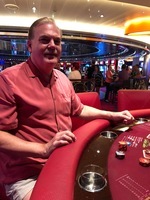 This was my sixth cruise with Carnival. 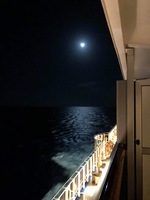 We booked Ocean Suite 7377 and were provided priority boarding which made getting onto the ship smooth and efficient. When initially boarding this newest ship in the Carnival fleet, you’re entering through the atrium which is small, absurdly designed, and very disappointing. It’s one small room, with an oversized bar and every other cruise liner puts it to shame...it’s lack of grandeur is a prelude to all that’s missing on this ship. Carnival was definitely “ripped off” by the Vista shipbuilder. In fact, the entire ship is mundane, plain, drab, with a gawd awful orange palette that permeates and mutes any “splendor” the Vista may have presented. Let me state at this point, the Carnival staff on board our cruise was nothing less than superb, with plenty of smiles, greetings, and a positive attitude throughout our days. Our Ocean Suite was just a common room with a disappointingly small, narrow balcony and was by far the smallest “suite” I’ve ever stayed in...a poorly designed box with a tiny, limited access walk-in closet, uncomfortable couch and chair, limited storage space and faulty smoke detectors that sounded the alarm from shower steam. What a thrill! Activities on the Vista are endless. From the sky cycles suspended above the 14th deck, to the cargo net obstacle course and longest at-sea water slide, to the Lido deck giant screen TV showing current movies, to the smoke filled casino...way too much to list here. Other critics say the Vista food is “too fancy”...the Vista kitchen puts out phenomenal faire that did not disappoint. Lobster, filet mignon, prime rib, mahi-mahi, oysters, superb creamed spinach, prosciutto and melon, and that famous Carnival melting chocolate cake. The dining room is the highlight of this ship. Carnival is cost cutting and the Vista drives home this fact. Constantly promoting the four additional cost restaurants, charging to enter the two theaters, charging for room service, using pre-recorded music in their stage shows, charging $10.50 for watered down drinks, to the $3.75 charge for a bottle of water...they’ve also cut out the 10pm grand dessert buffet with ice carvings. These may seem trivial to some cruisers, but the comments overheard on the elevators drive home the fact that eliminating “perks” for regular customers will impact Carnival in the years to come. My first cruise was on the Carnival Triumph in 2000 and the experiential impact between that cruise and this one on the Vista is in essence...disappointing. My travel friend and I just returned from our February 10-17 cruise on board the Carnival Vista. This was my sixth cruise with Carnival. 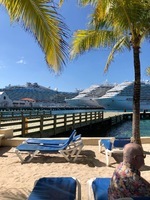 We booked Ocean Suite 7377 and were provided priority boarding which made getting onto the ship smooth and efficient. When initially boarding this newest ship in the Carnival fleet, you’re entering through the atrium which is small, absurdly designed, and very disappointing. It’s one small room, with an oversized bar and every other cruise liner puts it to shame...it’s lack of grandeur is a prelude to all that’s missing on this ship. Carnival was definitely “ripped off” by the Vista shipbuilder. In fact, the entire ship is mundane, plain, drab, with a gawd awful orange palette that permeates and mutes any “splendor” the Vista may have presented. Let me state at this point, the Carnival staff on board our cruise was nothing less than superb, with plenty of smiles, greetings, and a positive attitude throughout our days. Our Ocean Suite was just a common room with a disappointingly small, narrow balcony and was by far the smallest “suite” I’ve ever stayed in...a poorly designed box with a tiny, limited access walk-in closet, uncomfortable couch and chair, limited storage space and faulty smoke detectors that sounded the alarm from shower steam. What a thrill! Activities on the Vista are endless. From the sky cycles suspended above the 14th deck, to the cargo net obstacle course and longest at-sea water slide, to the Lido deck giant screen TV showing current movies, to the smoke filled casino...way too much to list here. Other critics say the Vista food is “too fancy”...the Vista kitchen puts out phenomenal faire that did not disappoint. Lobster, filet mignon, prime rib, mahi-mahi, oysters, superb creamed spinach, prosciutto and melon, and that famous Carnival melting chocolate cake. The dining room is the highlight of this ship. Carnival is cost cutting and the Vista drives home this fact. Constantly promoting the four additional cost restaurants, charging to enter the two theaters, charging for room service, using pre-recorded music in their stage shows, charging $10.50 for watered down drinks, to the $3.75 charge for a bottle of water...they’ve also cut out the 10pm grand dessert buffet with ice carvings. These may seem trivial to some cruisers, but the comments overheard on the elevators drive home the fact that eliminating “perks” for regular customers will impact Carnival in the years to come. My first cruise was on the Carnival Triumph in 2000 and the experiential impact between that cruise and this one on the Vista is in essence...disappointing. This Ocean Suite is a small, common balcony stateroom, with a “Suite Price.” Terrible color scheme, a small narrow balcony, uncomfortable couch and chair, limited storage, a walk-in closet touted as a “dressing area” (for little people)...smoke detectors set off by shower steam. This “Suite” was priced at $3480.00 for two people. It did have comfortable beds, dual sink bathroom, large screen television, and Michelle, our superb cabin steward. There was no comparison with Suites on the Triumph, Legend, Dream, Glory or Splendor. One of my favorite ports. Always welcoming, festive, fun, musical, happy! Awesome food and drink. Shop ‘till you drop! As with all cruise ship ports, getting off the main streets to enter the embarkation area is a traffic nightmare, but once you’re out of the car, suitcases rolling behind you...you’ve got it made! One of the better ports, except there’s no terminal to park the ship here...it’s either a tender or a water taxi to get to shore which can be an “E-Ticket” ride depending on the unpredictable Caribbean Ocean. Make sure you do the Stingray City excursion and take some time to walk around the very safe, clean, secure city of Georgetown. There are plenty of jewelry bargains...you just have to do some comparison shopping and remember that everything is negotiable. Carnival would do well to avoid this poverty stricken country. 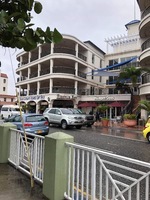 Yes, the taxis and air conditioned busses whisk you away from the port to your wonderful excursions, but if you really want to experience Jamaica just take a cab downtown and drive through the city.